There it was, in the middle of the night. That idea that wakes you up and doesn't let you go back to sleep until you note it. 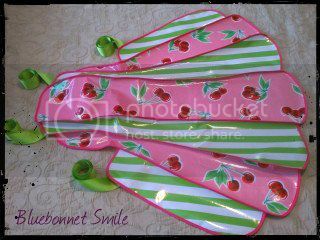 Diet Cherry Limeade, my favorite Sonic drink, and the perfect name for today's great oilcloth apron. What do you think? Don't forget to come visit us at The Girls at Rusted Gingham Barn Sale in Gonzales, TX, November 2 and 3.